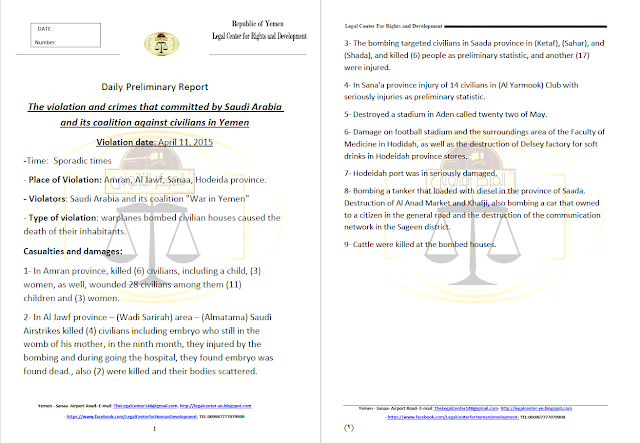 On 11th April 2015, the Saudi led coalition airstrikes killed at least 4 civilians including 2 women and 1 child in Amran province when they hit a residential house, and wounding 1 more. 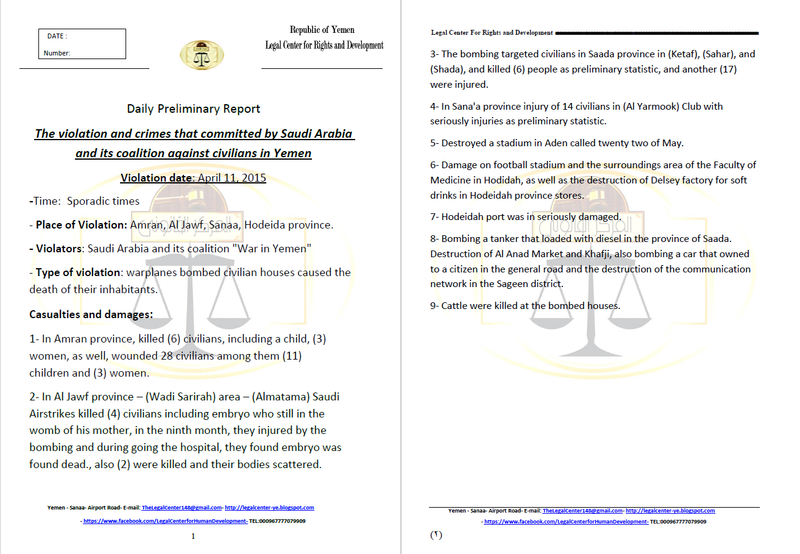 On April 11, 2015 at about 11:45 a.m., a coalition aircraft dropped two bombs near the office of the Ministry of Education in Amran, a town under Houthi control 40 kilometers (25 miles) northwest of Sanaa. One bomb hit a single-story building housing three families about 20 meters (66 feet) outside the education ministry compound, killing four members of one family, including two women and a girl, and wounding one more. "When I got to the house, there was still dust in the air, and everything was covered in a layer of black ash. My wife and kids were lying there, covered in black ash. Thank God they were alive. I saw my sister-in-law, Asma, and her daughter under some rocks, and I tried to dig them out. Asma’s head was open, and her leg was bleeding. Her 2-year-old daughter, Hyam, was lying on her shoulder, her head was smashed open. Her other daughter, Hasna, who’s 7, was shouting “Baba” [father]. Her hair and skin were covered in ash, and she was burned badly. Her father, my brother Muhammad, had been asleep when the strike happened, and the roof landed on top of him. When I dug him out, there was a thin trickle of blood dripping from his ear. He was already dead." 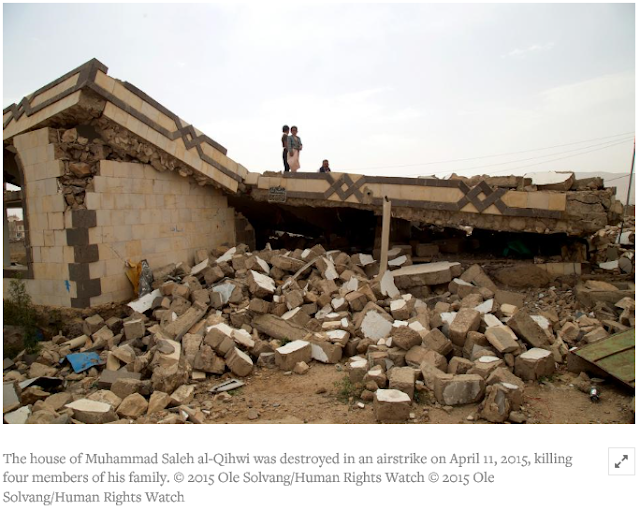 Al-Qihwi told Human Rights Watch that as far as he knew, there were no Houthi or other military forces or structures in the area at the time of the airstrike, nor had he seen Houthis using the education ministry building. On that morning he had not seen any Houthi vehicles on the road. He said that the only other airstrike in the area had taken place a few days earlier, and had struck a park a few kilometers away, near Amran University, but he did not know what the intended target of that strike was either. Muhammad al-Harasi, 31, a guard at the Ministry of Education building who was present at the time of the airstrike, told Human Rights Watch that he saw anti-aircraft fire coming from a mountain a couple of kilometers to the southwest. He also said that he believed that senior officials from Amran’s administration had been meeting in a nearby house. Human Rights Watch examined the site on July 23. Al-Qihwi’s house had been completely destroyed by the bomb blast, which had also blown out a section of the concrete wall surrounding the Ministry of Education compound. A second bomb had left a crater next to the road near the compound. An attack on the Ministry of Education compound would have been unlawful, unless the compound was being used for military purposes. Civil authorities would not be legitimate military targets unless they were directly involved in planning or participating in military operations. On the same day, a football stadium in Aden and a football stadium in Al-Yarmook in Sana'a province were also destroyed. On the same day, a soft drinks factory in in Hodeidah was destroyed.